The positive tone, however, came days after he said negotiations are moving “far too slow.” Furthermore, studies show the emissions cutbacks the world’s largest polluters are agreeing to won’t be enough achieve his goal of limiting global temperature rise to less than two degrees Celsius by 2100. 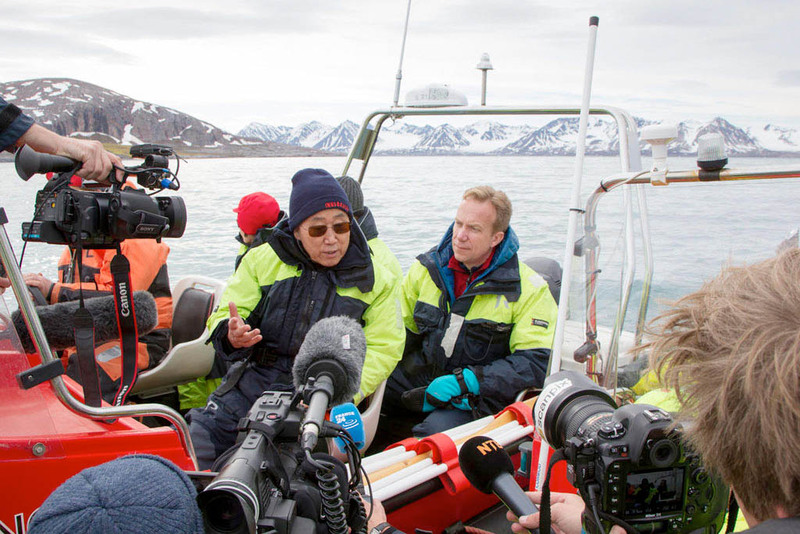 Ban’s two-day tour was his second trip to Svalbard, following a three-day tour in 2009 before the last U.N. climate summit in Copenhagen. He repeated previous concerns about the rapid shrinking of glaciers, this time having firsthand knowledge of the changes in a relatively short timespan. 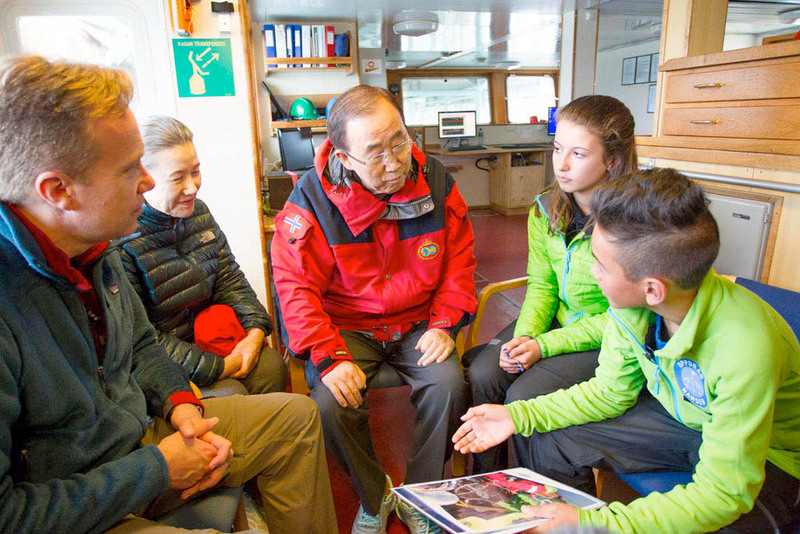 U.S. Secretary-General Ban Ki-moon meets with Erika Gjelsvik, 13, and Johannes Breivik, 13, aboard the Lance research vessel. The youths were part of a student group that skied to the North Pole and participated in a sea ice study aboard the ship this year as part an effort to raise awareness about climate change impacts. Photo by Rick Bajornas / United Nations. But that’s not likely to happen with the currently planned emissions cutbacks. The European Union is agreeing to cut its 1990s levels by 40 percent by 2030, while the U.S. is planning a cut of 26 to 28 percent from its 2005 levels by 2025. China is pledging its emissions will peak by 2030, which is prompting demands from other countries for more aggressive and specific action. A study by the International Energy Agency says such cuts are “consistent with an average temperature increase of around 2.6 degrees Celsius by 2100 and 3.5 degrees Celsius after 2200.” A separate study from Bloomberg New Energy Finance shows carbon emissions are set to rise by 13 percent in 2040. Another major sticking point is money, with rich countries failing to live up to a pledge from Copenhagen to provide $100 billion to poor countries for climate pollution and protection by 2020. Ban, meeting with world leaders at the end of June, said talks are bogged down and numerous controversies remain with only 10 formal days of negotiation left before the United Nations Climate Change Conference in Paris, according to The Guardian. Ban kept to a more upbeat tone during his Svalbard tour, which included visits to Ny-Ålesund, the Svalbard Satellite Station and a cruise on the Lance research vessel.